13.9.1919: Launched by Cook, Welton & Gemmell Ltd, Beverley (Yd.No.369) for Neale & West Ltd, Cardiff as HATSUSE. 4.3.1920: Registered at Cardiff (CF61). 3.1920: Completed (Wilfred Neale, Morley H. Neale & Joshua S. Neale, managers). 5.1927: Sold to Consolidated Steam Fishing & Ice Co (Grimsby) Ltd (64/64), Grimsby. 20.5.1927: John Denton Marsden appointed manager. 20.5.1927: Registered at Grimsby (GY438). 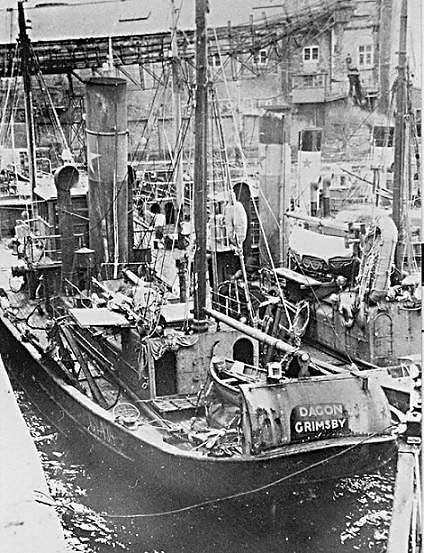 5.7.1927: Registered at Grimsby as DAGON (GY438) (BoT Minute M/R.G.1256/1927 dated 27.6.1927). 29.9.1927: Owners re-styled Consolidated Fisheries Ltd, Grimsby (Sir John D. Marsden, Bart, manager). 30.11.1928: Vessel mortgaged (64/64) to Midland Bank Ltd (A). 8.9.1934: Outward to Faroese fishing grounds in thick fog at about 9.00 a.m. stranded at Dundonnan (..ie) Head, 31/2 miles from Peterhead. Crew launched boat to lay out kedge and under power tried to refloat but hawser parted. Drifted clear but ran aground in small landlocked channel. With great difficulty crew rescued by breeches buoy with lifeboat standing by. 12.9.1934: Suffered extensive bottom damage but refloated by Aberdeen salvage tug IRONAXE (296g/1916) and towed into Peterhead. Repaired. 26.8.1939: Requisitioned for war service appointed for minesweeping duties (Hire rate £91.13.0d/month). 3.10.1941: Sold to J. Marr & Son Ltd (64/64), Fleetwood for £14,500. 8.10.1941: Leslie James Marr appointed manager. 25.9.1945: Sold to A. J. Tilbrook Ltd (64/64), Milford Haven for £18,500. 10.10.1945: Vessel mortgaged (64/64) to Lloyds Bank Ltd, London (B). 11.10.1945: Arthur Ernest Rees, Neyland appointed manager. 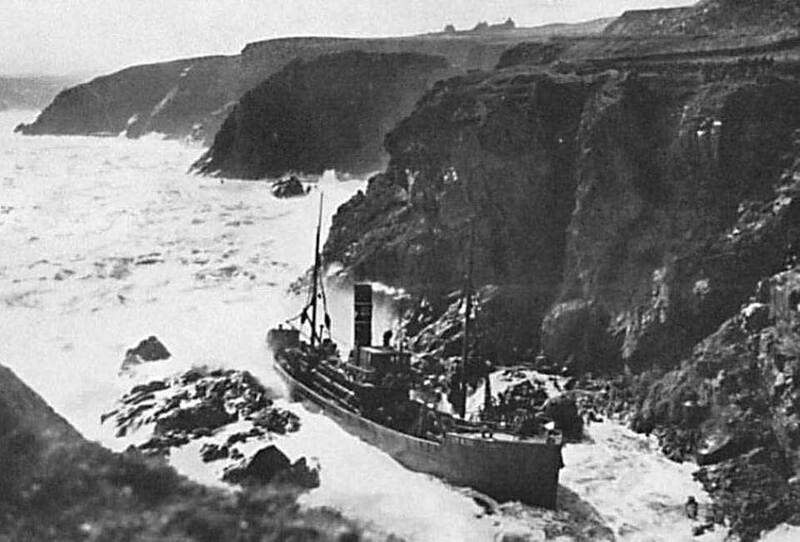 3.10.1948: In strong SE winds and thick fog ran aground on rocks in Ship Sound north of Slyne Head, Co Galway (Sk J. Garnham Jnr). 4.10.1948: Refloated under own power and proceeded to Limerick. 9.10.1948: Entered dry dock for temporary repairs. 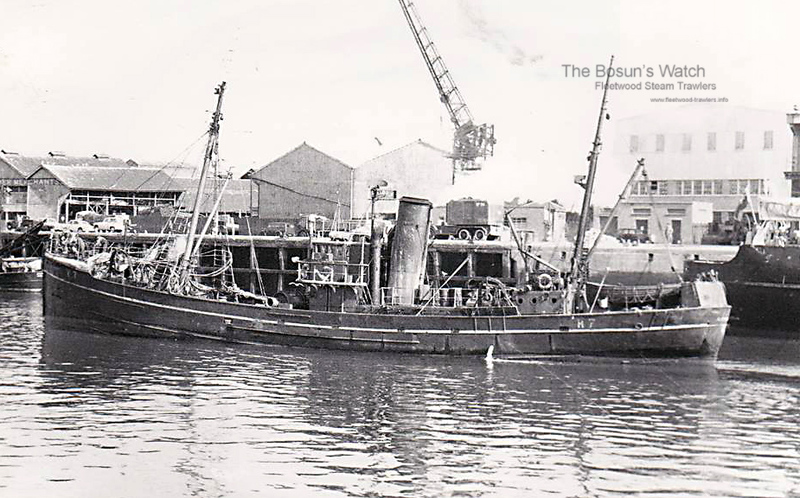 11.3.1952: Sold to Devanha Fishing Co Ltd (64.64), Aberdeen. 20.3.1952: William Wood appointed manager. 22.3.1952: Registered at Aberdeen (A710). 22.7.1952: Registered at Aberdeen as CASIMIR (A710) (MoT Minute R.G.No.1156/52 dated 14.7.1952). 1955: Sold to BISCO and allocated to Shipbreaking Industries Ltd for breaking up at Charlestown, Fife (Contract No.92D). 28.11.1955: Delivered Charlestown and breaking up commenced. 16/05/2012: Page published. 6 revisions since then. This entry was posted in Steam Trawlers, Steamers (Picture) and tagged Marr on May 16, 2012 by Fred Smith. 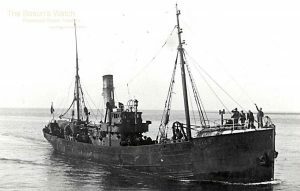 16.9.1924: Launched by Cook, Welton & Gemmell Ltd, Beverley (Yd.No.461) for Kingston Steam Trawling Co Ltd, Hull as ANDALUSITE. 1.11.1924: Registered at Hull (H90). 10.11.1924: Completed trials and accepted (Walter Scott, manager). 24.3.1925: John Lown appointed managed. 13.11.1924: Sailed on maiden trip to Icelandic grounds. 1.12.1924: Landed 1032 kits grossed £2740. 13.9.1933 : Sold to J. Marr & Son, Fleetwood (Geoffrey Edwards Marr, manager) for £7600. 15.9.1933: Registered at Fleetwood (FD195). 14.12.1933: Registered at Fleetwood as CORENA (FD195). 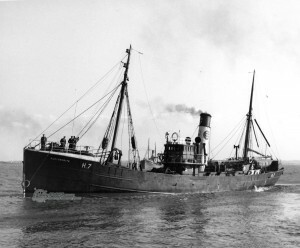 10.7.1934: Transferred to Hull, crewed and operated by The City Steam Fishing Co Ltd, Hull on the company acquisition (Geoffrey Edwards Marr, Fleetwood, manager). 8.1939: Sold to The Admiralty (£9,500). 9.8.1939: Fleetwood registry closed. Fitted out as a minesweeper (1-12pdr) (P.No. FY.709). Based Harwich with M/S Group 4. 24.7.1940: In North Sea (Ty/Sk. A. E. Fisher RNR). 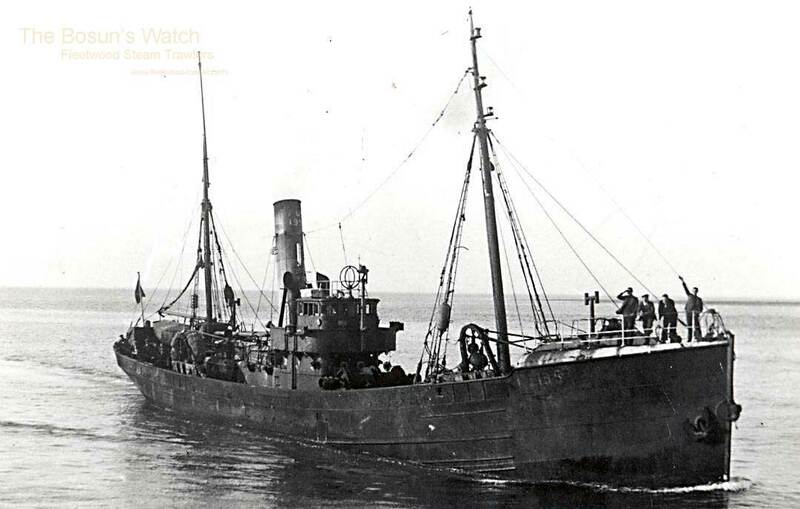 Picked up survivors of HM Trawler FLEMING (H3) which foundered after attack by German aircraft. 3.1946: Refitted and re classed at Hull. 4.1946: Sold to Craig Fishing (Aberdeen) Ltd (Joseph Craig, manager). Registered at Aberdeen (A198). 9.1948: Engaged in the Greenland fishery (Sk.C. H. Winter); fourteen crew. Ran into icebergs and fog, stranded 6 miles north of Frederikshaab, Greenland, holed in the engine room and making water . Crew took to boat and some hours later a motorboat with a rescue party of local fishermen arrived and towed them to Frederikshaab. From there, a Danish gunboat picked them up and transferred them to Feringhavn. Faroese smacks called nine days later and took them to Torshavn where they obtained passage to Aberdeen. Salved and broken up. 16/05/2012: Page published. 8 updates since then. 31/12/2016: Repaired broken image links. 07/08/2017: Removed FMHT watermark from image. 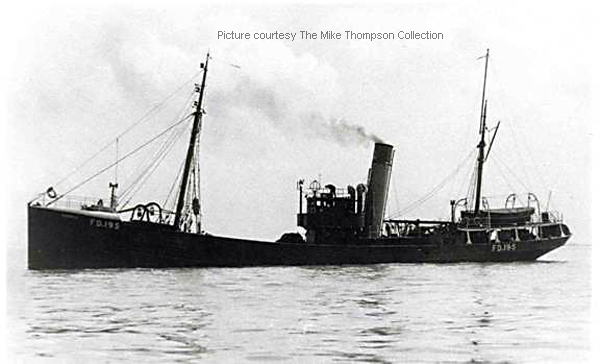 18.8.1933: The Board of Kingston Steam Trawling Co Ltd decided to exercise their option with Cook, Welton & Gemmell Ltd to build two more middle water trawlers to the same design as the AVANTURINE (Yd.No.542) but with amendments in respect of hull dimensions. Contracts were signed with the shipyard and with Charles D. Holmes & Co Ltd to make the engines and boilers. The price agreed was £13,610 for the first vessel and £13,560 for the second. The names chosen were ALEXANDRITE and ANDRADITE. Two further trawlers were subsequently ordered to this design, ARAGONITE (Yd.No.594) and ACHROITE (Yd.No.596). Total cost for ANDRADITE, with amendments, certification, fees, fishing gear and other equipment £14,272.12.9d. 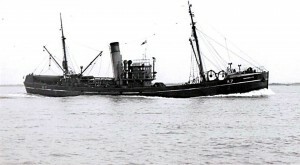 1.2.1934: Launched by Cook, Welton & Gemmell Ltd, Beverley (Yd.No.588) for Kingston Steam Trawling Co Ltd, Hull as ANDRADITE (named by Mrs Bridget Adams). 23.1.1934: Completed trials and accepted. 23.2.1934: Registered at Hull (H26). 16.3.1934: Sailed on first trip to Faroes (Sk. Stephenson). 31.3.1934: Landed 767 kits grossed £497 (15 days). 12.8.1939: Sailed for Faroes (Sk. J. Neve). 28.8.1939: At Hull landed 732 kits £701 gross. Last landing prior to being requisitioned. 28.8.1939: Admiralty telegram advising ALEXANDRITE and ANDRADITE would be requisitioned at 10.30 am. Landed gear. 28.8.1939: Requisitioned for war service (Hire rate £187.16.0d/month). 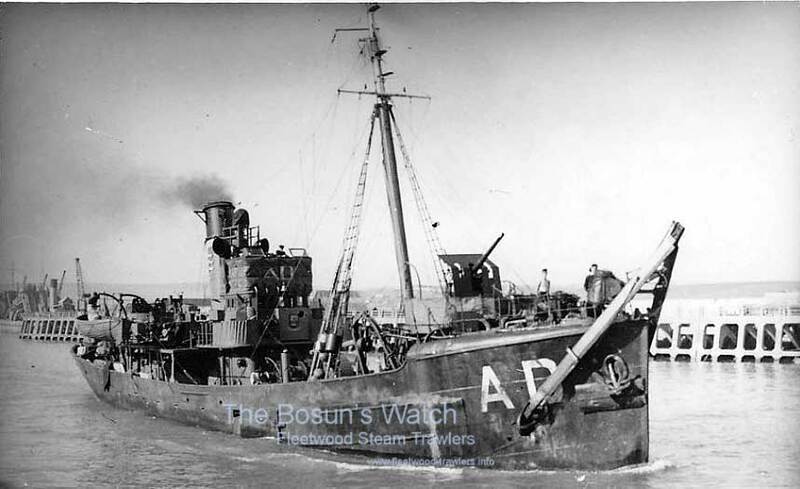 1.9.1939: Sailed for Aberdeen with RN crew. Fitted out on examination service (1-12pdr) (P.No. FY.559). 1940: Fitted out as a minesweeper. Based Dover with M/S Group 46 (Ty/Sk. E. H. Brooks RNR). 1941-1942: Remained at Dover with M/S Group 46 (Ty Lieut. 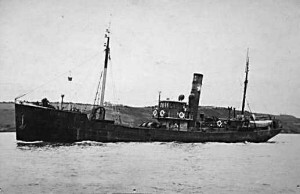 E. S. Brookes RNVR). 17.1.1946: Returned after refurbishment by Globe Engineering Co Ltd, Hull and survey. 19.1.1946: Sailed on trip to Faroes grounds (Sk. W. Swain Snr). 23.2.1949: Sold to J. Marr & Son Ltd, Fleetwood for £30,250. Geoffrey Edwards Marr, Brough designated manager. 11.7.1949: Last landing at Hull prior to transfer to Fleetwood. 6.3.1957: Sailed Fleetwood for Faroes grounds (Sk. John Henry Blackshaw); fifteen crew. 7.3.1957: Stranded on rocks at Barra Head. At 3.30am. message received by Barra Lifeboat Station from Stornoway coastguard that the trawler was was ashore near Curachan Rock. Barra lifeboat, LLOYDS, launched at 4.10am. in a slight sea, southerly breeze and tide on the flood. Lifeboat found the trawler some 5 miles NE of Curachan Rock, took off the crew and at 7.30am. landed them safely at Castlebay, Barra. Vessel sustained extensive bottom damage and declared a total loss. 3.5.1957: Hull registry closed “Ship ashore total loss”. 01/08/2017: Removed FMHT watermark from image. This entry was posted in Lost Vessels, Steam Trawlers, Steamers (Picture) and tagged Lost, Marr on May 14, 2012 by Fred Smith. 18.8.1933: The Board of Kingston Steam Trawling Co Ltd decided to exercise their option with Cook, Welton & Gemmell Ltd to build two more middle water trawlers to the same design as the AVANTURINE (Yd.No.542) but with amendments in respect of hull dimensions. Contracts were signed with the shipyard and with C. D. Holmes & Co Ltd to make the engines and boilers. The price agreed was £13,610 for the first vessel and £13,560 for the second. The names chosen were ALEXANDRITE and ANDRADITE. Two further trawlers were subsequently ordered to this design, ARAGONITE (Yd.No.594) and ACHROITE (Yd.No.596). Total cost for ALEXANDRITE, with amendments, fishing gear and other equipment £14,242.12.9d. 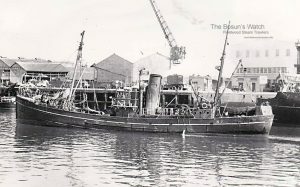 21.12.1933: Launched by Cook, Welton & Gemmell Ltd, Beverley (Yd No.585) for Kingston Steam Trawling Co Ltd, Hull as ALEXANDRITE (named by Miss Billaney, daughter of skipper). 20.1.1934: Registered at Hull (H7). 25.1.1934: Sailed from Hull on first trip (Sk. William Billaney). 6.2.1934: Landed 755 kits grossed £966. 10.8.1939: Last landing prior to being requisitioned. 28.8.1939: Admiralty telegram advising ALEXANDRITE and ANDRADITE would be requisitioned at 10.30 am. 1.9.1939: Sailed for Aberdeen with RN crew. Fitted out on examination service (1-12pdr) (P.No. FY.560). 1940: Fitted out as a minesweeper. Based Grimsby with M/S Group 46 (Ty/Sk. G. D. Barker RNR). 1941: Based at Dover with M/S Group 46 (Ty/Sk. G. D. Barker RNR). 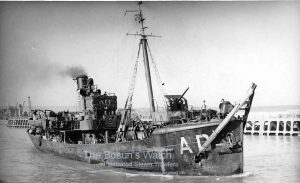 2.6.1945: Arrived at Hull for restoration by Saint Andrew’s Engineering Co Ltd.
1.11.1945: Returned to owner and reclassed at Hull. 17.12.1946: New boiler ordered from C. D. Holmes & Co Ltd, Hull at a cost of £5.700. 23.2.1949: Sold to J. Marr & Son Ltd, Fleetwood (Geoffrey Edwards Marr, manager) for £30,250. 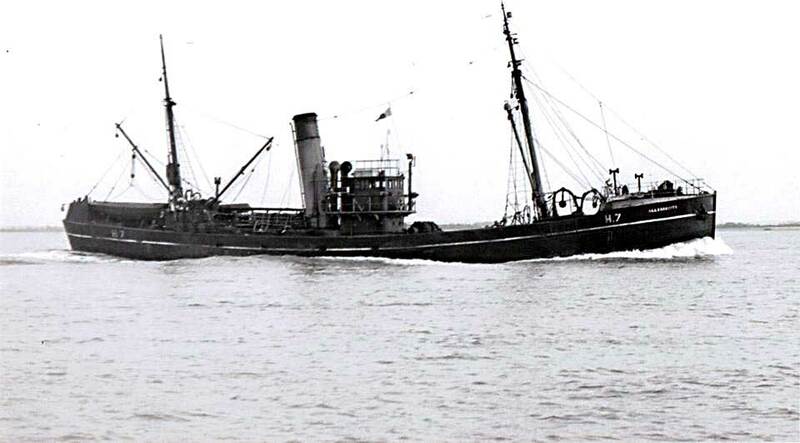 4.12.1951: Sold to North Star Steam Fishing Co Ltd, Aberdeen (John Alexander Harrow, manager) for £29000. 1952: Fishing from Fleetwood ( J. Marr & Son Ltd, managers). 6.1955: Transferred to fish from Aberdeen. 11.1955: Converted for burning oil fuel, F.P. above 150° F.
1963: Sold to Motherwell Machinery & Scrap Co Ltd, Motherwell for breaking up at Grangemouth (yard formerly owned by G. & W. Brunton). 14/05/2012: Page published. 6 revisions since then. This entry was posted in Steam Trawlers, Steamers (Picture) and tagged Marr on May 14, 2012 by Fred Smith.